The role of the accountant is moving away from its traditional roots of compliance, and those in the sector are now putting a greater focus on helping companies to plan and prepare for their futures. Accountants are taking on additional responsibility, and as a result their expertise is becoming increasingly valued. In Wales, for example, there is clear evidence that accountancy is a profession on the rise. In Wales Business Insider’s October publication, 16 of the nation’s 17 biggest firms said they were actively looking to hire more members of staff in the next 12 months. Deloitte, one of the ‘big four’ accountancy corporations, said it expects to take on another 150 people within the next year. Just a few years ago many recruitment experts predicted that the sector could flounder due to the rise of advanced accounting software such as Sage and Xero, but the industry has instead gone in the exact opposite direction. Research carried out by Sage has discovered that the top 50 accountancy firms in the UK will have a combined income of almost £13 bn in 2016 alone, an increase of around £1 bn in the last 12 months. A willingness to adapt to a complex financial climate and the new range of skills and techniques being taught to the accountants of the future have ensured the sector’s prosperity. Accountancy firms continue to expand and, because professionals are now adept at offering advice, assistance and guidance with regard to business-wide procedures and processes, the services of those in the sector are only becoming more in demand. The opportunities within the accountancy sector are vast and varied, and it is a profession that will only go from strength to strength in the years to come. Whether you wish to work with freelancers, consultants, small businesses or large corporations, Mont Rose College, one of the most respected colleges in London, can provide you with the knowledge and comprehension required to thrive in a challenging, but ultimately rewarding, work environment. 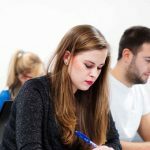 If you are looking for a college in Ilford that can provide you with the foundations on which to build a successful accountancy career look no further. To discover more about the modules and topics you will cover, or to learn more about the college itself, please do not hesitate to get in touch. Send an email to info@mrcollege.ac.uk or call us on 020 8556 5009.